One of our BEST members is featured on the Notebookism.com website today. 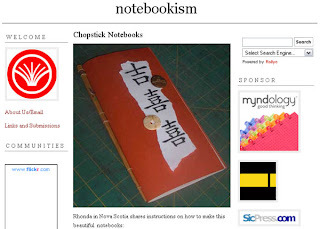 MyHandboundBooks offers some tutorials on her blog and the Notebookism people asked if they could put a little feature on their site! Check out this Chopstick Notebook tutorial and her other tutorials at MyHandboundBooks.Blogspot.com. ooh, nice job rhonda! :D that's a cute little book!